What are the symptoms in Stage 1 Lyme Disease? Ticks will attach anywhere on the body, but prefer warm or hidden places, such as, the armpit, groin, back of the knee, and near the hairline. Please note that multiple rashes may, in some cases, appear elsewhere on the body some time after the initial rash, or, in a few cases, in the absence of an initial rash. These symptoms may be brief, only to recur as a broader spectrum of symptoms as the disease progresses. The bite spot or rash usually disappears after about 3 to 4 weeks. About 25% of infected people never develop—or at least never notice—the characteristic red spot. Lyme disease symptoms can be mild and easily overlooked. People who are aware of the risk of Lyme disease in their communities and who do not ignore the sometimes subtle early symptoms, are most likely to seek medical attention and treatment early enough to be assured of a full recovery. People with an allergy to tick saliva can develop a red rash at the site of the tick bite soon after being bitten; this rash typically lasts for 24 to 48 hours, but may continue for up to a week. This reaction may be confused with the EM rash. 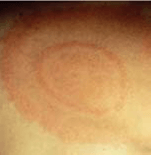 However, an allergic-type rash begins earlier after the tick bite, does not expand, and typically becomes less red over time. In contrast, EM expands and often becomes more intensely red over time. When in doubt, a healthcare provider should be consulted. The provider can help distinguish between redness that does not require treatment and EM, which requires treatment.